I usually read something connected with WWI around November & this year, it's been the diaries of WWI nurse, Edith Appleton. Her diaries have been transcribed by her great-niece & nephews & were originally available on this fascinating website. As well as the diaries, the family have included a brief biography of Edie, letters from & about her & a complete index of everyone mentioned in the diaries. More information about Edie, her colleagues & the men she nursed is being unearthed thanks to the website & the wonders of the internet. An edition of the diaries has now been published by the Imperial War Museum, edited by Ruth Cowan. Edie was born in Kent in 1877 & by the time war broke out in 1914 had been nursing for over 10 years. She volunteered for Queen Alexandra's Imperial Nursing Service & spent the next five years nursing in France & Flanders. She kept a diary throughout her war service but, unfortunately, not all of it has survived. Hopefully they may still turn up somewhere. The diaries we do have begin in April 1915 & there's another long gap between November 1916 & June 1918. However, what we do have gives a fascinating picture of wartime nursing on the Western Front & a portrait of the dedication & courage of Edie & all the other medical staff who witnessed the horrors of war. I've often wondered how nurses managed to keep going day after day as they saw endless convoys of wounded & dying men & struggled to help them. In Edie's case, I believe it was her love of nature & her determination to take advantage of any opportunity of getting away from the hospital in her precious time off. Wherever Edie is stationed, she swims, walks or goes for long drives alone or with her colleagues. she's interested in everything & everyone she meets. Maxey, Truslove & I had a half day, so we walked to Bénouville in the rain and picked primroses that were hanging from the banks in yellow tufts. At Bénouville, we peeped into the church and found service in progress - so went to the café for tea of bloaters, boiled eggs, toast and tea. After tea the old woman showed us her old china and pewter. Such a nice little woman - her husband is away at the war and she was busy making herself a coat out of an old one of his. She turned the stuff and piped it with black velvet and made a strap for the waits and sleeves - very smart. March 20, 1916. Much of Edie's work consisted of organization, routine & hard graft. She worked in Casualty Clearing Stations, mobile units that operated close to the Front & ministered to men who were brought by ambulance direct from the battlefield. Many were dead or dying by the time they arrived. They were all dirty, in pain & often in shock. Conditions & equipment were basic & often the men were on stretchers on the floor. The work could be dangerous too as troop movements were often sudden & the CCS could be ordered to move very quickly, taking wounded men with them. At other times, they were shelled by the enemy but kept working through the bombardment. Several times, staff were injured by shells & shrapnel. Once the emergency treatment was given, the men were put on convoys & sent by train and boat back to England. Edie never knew from one day to the next how many convoys might arrive. Sometimes they were prepared for a great influx of wounded & nobody came. Other times, the wards were overflowing & the staff worked 20 hour shifts to tend to them all. If any nurses were off sick, everyone else just worked harder & longer. Sometimes it's not the demands of the war but of politics & PR that determined the workload. Apart from Royal visits, the work went on. In 1918, Edie was transferred to no 3 General Hospital at Le Tréport. The hospital was in a large hotel on the coast so no more tents but the work was just as dispiriting at times. After the war, Edie was demobbed in 1919. She returned to nursing in England for a time. She & her sister bought a house on the Isle of Wight where they kept chickens & grew vegetables. Several of their siblings made their home with them. Edie married when she was 49. Her husband, Jack, was her sister's stepson & 10 years her junior. He died after only 10 years of marriage & Edie died at the age of 80 in 1958. 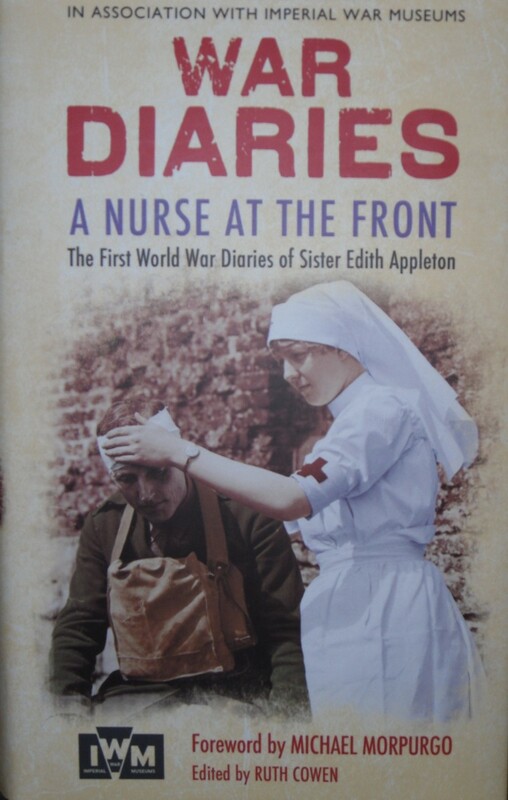 Edie's diary is an invaluable record of nursing in WWI. Her good humour, efficiency & dedication must have made her a valuable part of the team at all her postings. I've just finished reading Virginia Nicholson's book about women in WWII, Millions Like Us. Virginia Nicholson notes that almost all the women she interviewed, when asked why they had joined up or how they coped with the privations of war, said "We just got on with it." I think Edie's response would have been the same. She was trained to do an important job & she did it magnificently. How lucky we are to be able to read her diaries & honour her memory. I like WWI and II books and yes the nurses story is always a good one. How they coped and survived are wonderful stories. I agree, Mystica. I'm always amazed at the stoicism of the medical staff in such dreadful conditions. Those books I didn't get to in 2011.